Printers are not one of those things that people give much thought to until they are in absolute need of one, but in this day and age of all-in-one (AIO) devices, you can think of them when you need a copier, a fax, a scanner or even, yes, a printer. 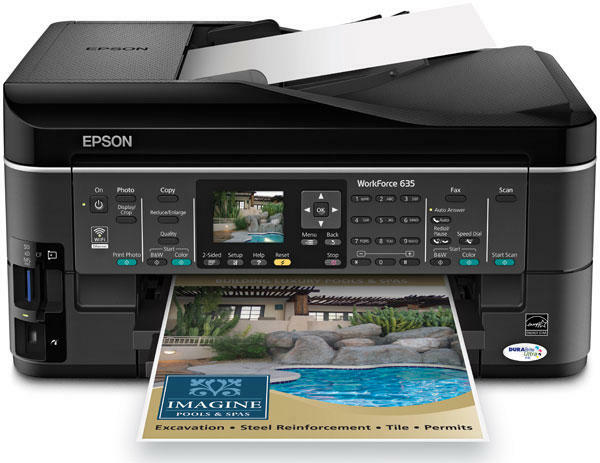 Luckily these devices are getting better and better, and the Epson WorkForce 635 has to be one of the best ones we've seen yet. The WorkForce 635 is the top of the new WorkForce 630 line, but don't let the designation scare you as it is actually reasonably priced. Although it has a list price of $229, $179 seems to be the common price on most online stores. 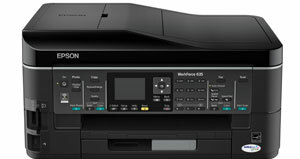 A decent price is nothing without good features, so what all does the WorkForce 635 offer you? 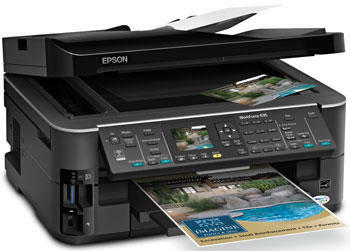 We ran the unit Epson sent us for testing through a series of tests, and we have to say we were pretty impressed. The most noticeable thing is during setup when you realize the only cables it come with is a phone cord for faxing and the power cord. It can use a USB cable for computer connections, but none is included. As the emphasis with this model is very clearly on it being a Wi-Fi printer on your network, there is an Ethernet port if you want to use, but no cable is included. While I know that Wi-Fi printers have been around for a while now, this is my first experience with the technology, and it worked pretty much seamlessly. Without the aid of a computer it quickly detected my network and connected itself in a matter of seconds. As it uses 802.11 b/g/n for everything it does, it has to work with as little hassle as possible, and it does. The control panel has the buttons to do anything you want, continuing the concept that the computer it a totally moot point in this device's life. You can click the image below for a much, much larger view and check out all of the controls. The software does need to be installed on every computer that you want to work with the printey r. It's nothing out of the ordinary, but I did notice a small oddity in that when I installed it on a Windows 7 laptop it defaulted to wanting to install a bunch of third-party software. Yes, you could skip it, but slightly annoying. However, going through the same process on an iMac, and it didn't default to installing those programs and instead gave me the option. Odd, but just a weird little quirk. It uses four ink cartridges (black, cyan, magenta and yellow), but from a quick price check, and from reports of how long these cartridges should last normal usage, I wouldn't worry too much about how much they will add to the continued life of this unit. As for its primary features, how are they at their jobs? As a photo copier it is fairly speedy while doing text or color images, and the quality is right up there. Black & white text was pristine, but I did find an issue with a color copy of a magazine cover. While the over all detail was good, about every 1.5-inches there was a thin line about maybe a pixel in height where you could tell the print heads had to readjust themselves. For something you might need in a hurry it is perfectly acceptable, but it would be questionable in a business presentation. What can you say … it faxed. Printing black & white text runs at about 15 ppm (pages per minute) according to Epson, and we have to agree with them; printing an 11 page document took next to no time at all. Color printing depends on what exactly it is you're printing, but a full page color photo, took about a minute and a half. Compared to the color copying, doing the photo at best quality left no lines, and it was a pretty seamless reproduction. Scanning did the job you would expect it to, but the bonuses here are it can be saved either to computers on the network, USB 2.0, memory cards (SD, xD, MS Pro and CompactFlash) and can be saved to various formats such as PDF. I loved it as much as you can love an all-in-one printer. It did everything it said it would, and did it fairly well with the exception of the color copies, and even that was still passable.